Here's a work in progress. A breakdown listing what set the Acadians and Beaumonts apart from its GM counter parts. Ok, to be clear from the get go, the information noted here, like a lot thats out their in regards to the Acadian and Beaumont is not written in stone. Additional information and revisions (Im sure) will be added over time. Feel free to email with additional information or corrections. Thanks! The 1962 Invader body styles were 2 and 4 door sedans plus station wagon. Upper scale Beaumont included these bodies along with convertible and 2 door coupes. Base price started at 2,383.00. Their were 14.654 Acadians registered in 1962. This placed the Acadian in 11th place in overall Canadian cars sales. 1164 Beamonts 2 dr htp's produced. Unique Acadian grille, split Pontiac style. Unique side trim, moldel to model. Gauge cluster with an "A" where the clock would be. First year for Chevelle based Acadian Beaumont. Base engine being the Chevrolet 194 cubic inch 120hp. Power up to including the 283, 220hp. Transmissions included the 3 spd standard, 2 spd powerglide and an optional (V8's only) 4spd. Unlike the Chevy II based Acadian interiors, Acadian Beaumont interiors were derived from the Pontiac Tempest. Total production 8,815. Tempest/Lemans derived interiors. When bucket seats and floor console were ordered, the Chevelle console was used. 1964-69 Acadian, Beaumont radio delete cover same as Tempest/Lemans. 1965 sales were down again; 6,390. Base price was 2,433. The hardtop Acadian was once again available.. Their were 274 SD Acadian Beaumonts produced and 23 L-79 cars. 6600 Acadian Beaumonts produced, lowest number between 64-69. 1965 Acadian Beaumonts did not have the L/R filler panels below the grill where as the Chevelle did. In 1965, Canada-U.S. Auto Trade agreement signed resulting in extensive plant and product realignment. In 1966, the enimic 4 cyl was no longer available.The opposite was true for the Chevy II / Nova where you could get the 4 cylinder through 1968. Base price for the Acadian was 2,507. The 327-350hp (L79) was available, 85 were produced.. The autopact was starting to have an impact as the Acadian line was now down to 6 models. The Canso station wagon was no longer available. Their were. 7,366 Acadians sold in 1966. Total Beaumont SD production equaled 3318. In 1967 their were 4,850 Acadians registered. Interior patterns were taking on more of the Chevy II styling. Base price equalled 2,571, approximately 25.00 more than the base Chevy II. The last Acadian built in Canada was completed in June 1967. The remainder of Acadians were manufactured at GM's Willow Run facility along with the Chevy II/Nova (and Corvair). 1967 Beaumont Custom's produced were 3452. This does not include the 451 SD Beaumonts. Then there are early '67 Beaumont SD's included within the production number of 3452. 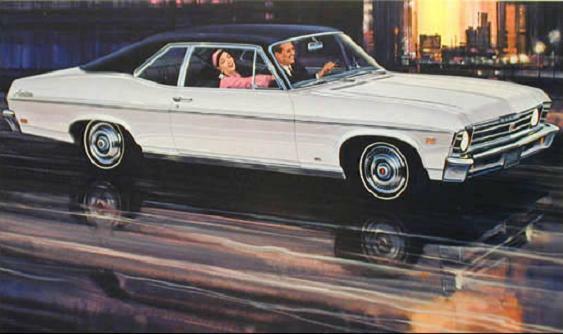 To clarify, early 1967 Beaumont SD's were an option package on the Beaumont Custom, therefore they are included in the production totatl of 3452 V8 cars. The production total of 451 cars is when the Beaumont SD became a seperate model of its own...again. 1967, Acadians used 1966 fenders, headlight rings. 1967 Beaumont Sport Deluxe option was not available until Jan. '67. Prior to that you ordered the top of the line Custom. Their were 70 1967 SD convertibles built. 1968 Acadian - blacked out grille excluding the second from the bottom and second from the top ribs.Grille is unique to 1968 as chrome strips were used. Interior style and material was now the same as the Nova with Acadian logo's replacing the Nova's. Base engine was now the 230, the 250 was optional, new was the 307, 327/275hp and 350/295hp which was only available if you chose the SS option (no longer SD) which ran approximately 240.00. Base price was now 2,696. Total Acadian sales equalled 5,353. Beaumont SD sales equaled 702. Prior to 1968, you could purchase an SD with any engine. Six or V8. Beaumont, the first casuality of the autopact? Though Chevelle used amber front signal light lenses, Beaumonts never did. Canadian federal law did not mandate them thus they were clear. Acadian, Acadian Beaumonts were produced at GM's Oshawa facility along side Chevy II's and Chevelle's distined for the Canadian market. 1968-69 Acadian distinctive V8 emblem was located below the front side marker lights where as the 1970 were located above the light. Willow run Acadians used a 7 to distuguish from the nova which was produced on the same production lines.